While my brother was visiting he met Mellicent. He wasn’t quite sure about her to begin with, but he admitted that he was going to miss her by the time he left. 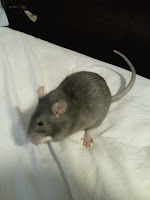 I pointed out to him that it was funny that he of all people should have reservations about a pet rat, seeing as he owned one when we were younger, but then he responded by saying that Melli was definitely more curious and adventurous than pet rat Whiskers of our childhood. I put that down to fond remembrances and didn’t think anything of it until I ran into a fact sheet on a website the other day. Turns out that female rats ARE more prone to scramble around and investigate, while male rats are often content to have their ears scratched and enjoy your company. Rats can eat chocolate. They can also eat smaller pets. They are omnivores and have been known to eat birds, fish and even smaller rodents. While it’s great to have both male and female rats, they should not be allowed to play together. Rats can complete the courting ritual and the whole romantic relationship in about 2 seconds. Rats usually bathe themselves six times a day or more. Rats have bellybuttons, but no tonsils or gallbladders. Rats can be trained to do simple tricks. Rats can train humans to do simple tricks. wow, that's interesting about the male-female differences. but that's really gross that you mentioned the whole mating part and the omnivore part. Rats can be fun pets. I used to let my rat run around the inside of my shirt when I was a kid. If you're not diligent about cleaning the cage FREQUENTLY, there can be odorous consequences. They'll also eat out of your hand. But don't offer an empty finger if they're hungry. Rat teeth are bug and sharp. Ha-ha-ha. Unfortunately, rats are short-lived critters. Two years seems to be the average lifespan. Then it's time to get another?